Cut parchment paper to about 15 x 9 1/2 inches to form a sling to allow you to easily insert and remove the meatloaf from your slow cooker. Combine turkey, 2 tablespoons enchilada sauce, oats, onions, 1/3 cup corn, 1/4 cup black beans, chopped cilantro, cumin, salt, onion powder, chiles, egg, and garlic. Mix everything well using clean hands, and then shape into a 9- x 5-inch oval loaf flattened slightly on top. Place loaf onto prepared parchment paper; while holding edges of paper, carefully insert into a 5- to 6-quart slow cooker (make sure lid closes well without the paper getting in the way). Cover, and cook on low for 6 hours or high for 3 hours. Pull loaf out of slow cooker using parchment sling; set aside. Wipe parchment clean; drain liquid from bottom of slow cooker. Return loaf to slow cooker using parchment sling. 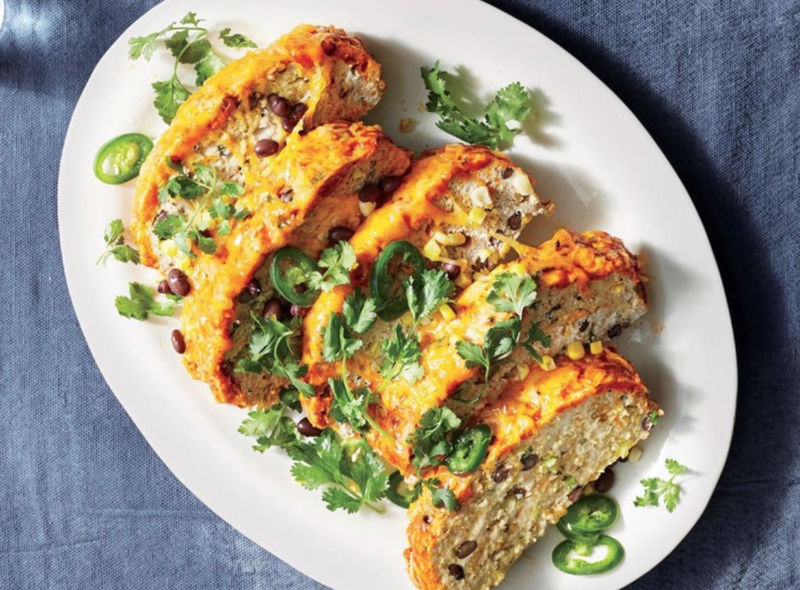 Cover loaf with remaining 2/3 cup enchilada sauce, cheese, jalapeño (if using), remaining 1 tablespoon corn, and remaining 1 tablespoon black beans. Cover and cook on high until cheese is melted, about 10 minutes. Garnish with cilantro leaves, if desired. Pull loaf out of slow cooker; cut into 12 slices.